I haven’t posted for (vegan) Meatless Monday in a while, it’s about time to get back into the habit! Here’s a super-easy recipe for vegan chili relleno. I was going to make a more intricate filling, but I was running late, Trader Joe’s black refried beans were already flavored with jalepenos, and replacing the cheese in the typical chili relleno with whole beans and stuff doesn’t sound like the right consistency anyways. Though I may do it anyways the next time. That’s it. Not much of a recipe, huh? 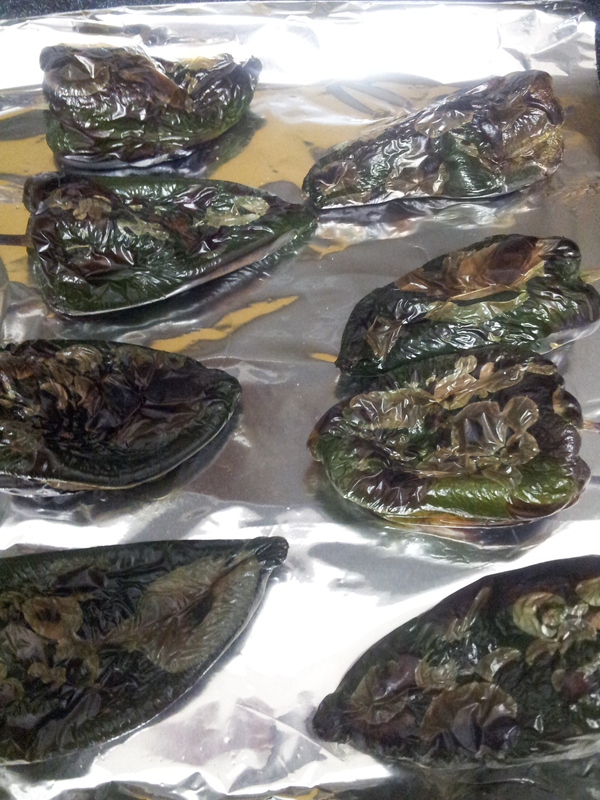 Place pobalano chiles on a cookie pan covered with tin foil. I didn’t grease the pan at all, but I would the next time because they stuck a little. Move the oven rack up if needed so it’s 6-8 inches below the broiler. Broil the peppers until blackened, about 10-15 minutes each side, then place in a paper bag to finish. After the peppers have cooled enough peel off the outer skin. I found this to be a bit of a challenge, mine were only about 2/3 peeled but I didn’t even notice in the end. Ya, they don’t look that great blackened but the kitchen does start to smell pretty dang good. Slice an opening from almost the top to almost the bottom of each pepper and clean out the seeds from the middle. I pushed them a little inside out and rinsed the seeds out in the sink. Fill center with about 2 tsp of the refried beans, close the pepper and place on pan. Serve alone or with a sauce. I personally always chose to use a sauce or dip when it’s an option! 3 Tbls water (and a splash) mixed with a about 2.5 Tbls ground flax, whipped to dip the chiles in first, then 1 cup spelt flour with pepper, cumin, and garlic powder mixed in to dip the chiles in second. This was much more experiment than recipe, I just sprinkled the spices in. I used a tomatillo sauce I found on the food network, mostly because I didn’t know what it was really and figured it was past time to find out. It was really good and I’d definitely make it again. My son liked it on the rellenos, but next time I’ll make a red sauce for them, probably with chilpote peppers in adobo sauce. I’m going to try a sauce like that next week to go with vegan tamales if I can pull it off. That said, the tomatillo sauce is pretty dang good. It was strangely sweet and I’m determined to find something that it would fit better with. I did use it as a chip dip too but it’s such an interesting taste it need to be the star of some other show. Toss the vegetables with the oil, salt and pepper. 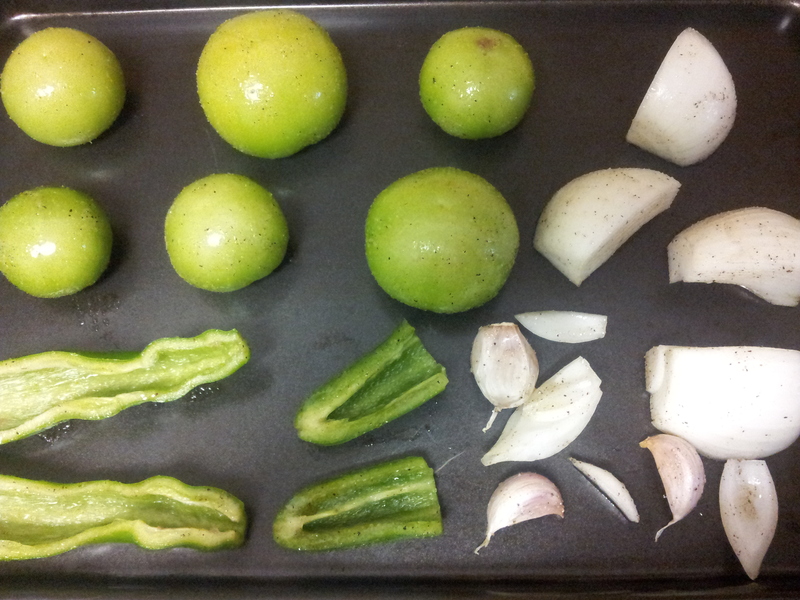 Roast the vegetables until the tomatillos turn a dark-green color and the onions golden brown, about 30 minutes. Let the vegetables cool, peel the garlic and blend everything together with the lime juice in a Ninja or food processor. 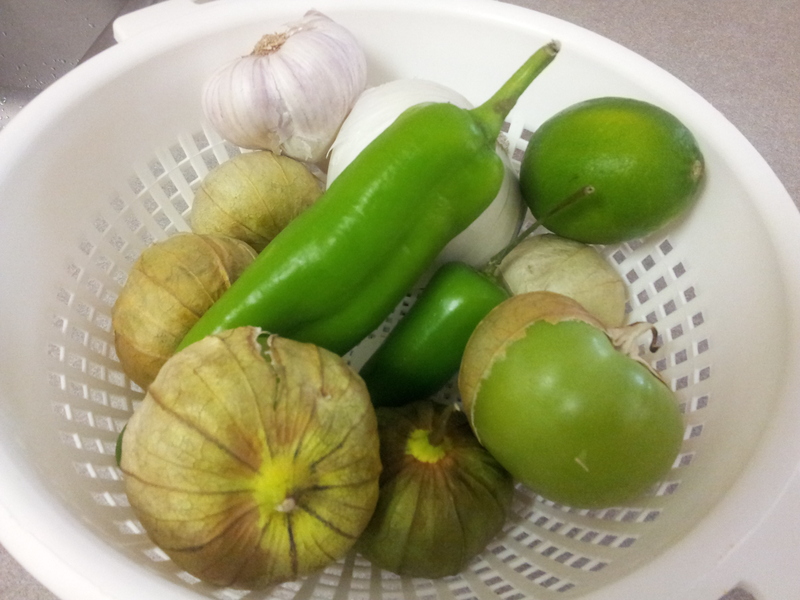 Have you ever tried a tomatillo sauce? Did you like it and what did you serve it with? 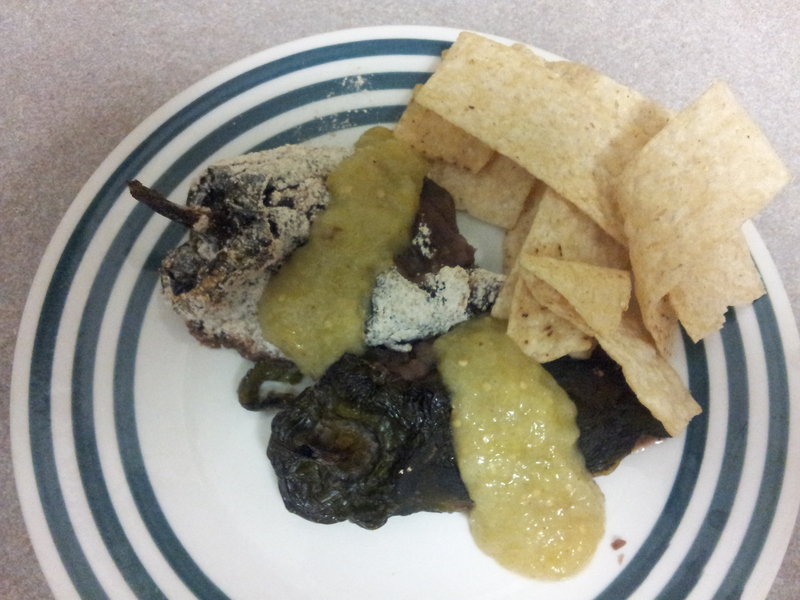 This entry was posted in Meatless Monday, Vegetarian and tagged chilli relleno, tomatillo, vegan by Kinda Zennish. Bookmark the permalink.